Rumour No. 1: Chelsea are preparing a summer bid for £10 million-rated Real Madrid midfielder Rafael Van Der Vaart. Manager Carlo Ancelotti sees the Dutchman as the perfect man to operate at the tip of his diamond (after Joe Cole and Deco have both singularly failed to shine there this season) and will make an early move for the 27-year-old, lest a good World Cup up his valuation. Rumour No. 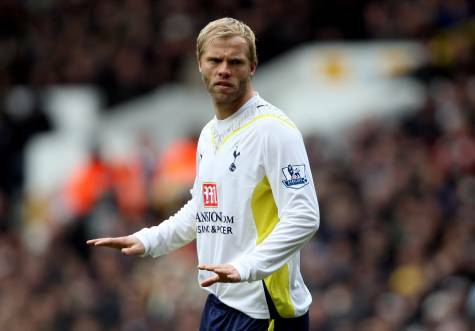 2: Tottenham Hotspur boss Harry Redknapp is very keen to make Eidur Gudjohnsen‘s loan stay at White Hart Lane into a permanent one. “I haven’t discussed [a permanent deal] with Eidur or the chairman yet but I like him very much. He’s a terrific footballer and a good lad as well. He showed his qualities on Saturday when he came on. The Best of the Rest: Another day, another ‘Cesc Fabregas rumour. This time it’s Inter Milan that are being linked with the Arsenal captain. Ho hum. Mathieu Flamini has revealed that he’d rather stay at AC Milan than return to England. Juventus director Roberto Bettega has again insisted that ‘keeper Gianluigi Buffon is not for sale at any price. Fulham are the favourites to sign Paul Scharner from Wigan Athletic in the summer. Blackburn Rovers are planning a £1 million raid on Notts County for goalkeeper Kasper Schmeichel. Manchester United are tracking Atletico Madrid’s young stopper, 19-year-old David de Gea. i bet they wish they bought sneijder.